Yesterday we reported on TEPCO’s admission of ongoing daily sea releases of contaminated water to the Pacific. 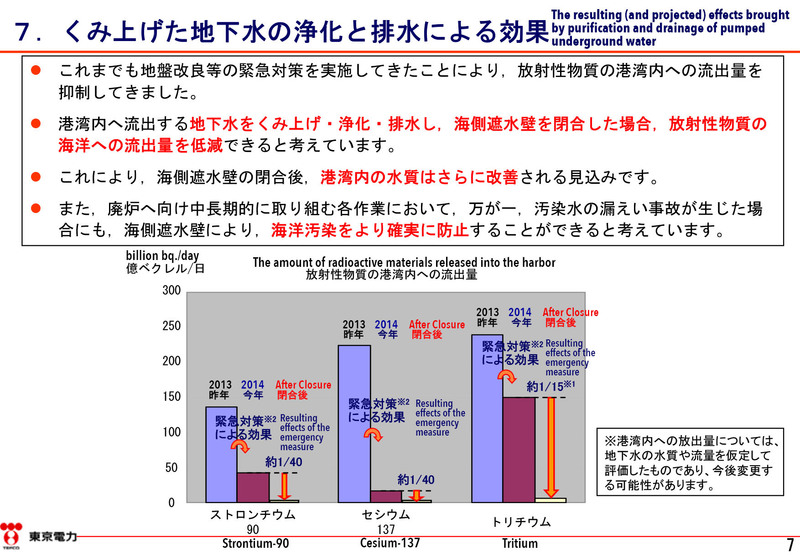 The TEPCO rep in the press conference cited the tritium level as being 1 billion becquerels per day. The graph submitted by TEPCO to METI showed a quite different amount for the tritium readings. The journalists at the conference prodded TEPCO for actual readings due to the graph having wide ranges and exact numbers were not published along side it. The cart appears to show a very clear reading of 150 billion bq per day for tritium at the 2014 rate, not the 1 billion bq per day quoted by TEPCO in the meeting. The other isotope readings quoted by TEPCO appear to be accurate. This big change in the daily tritium release increases the daily total radiation release to the sea as being 157 billion becquerels per day.